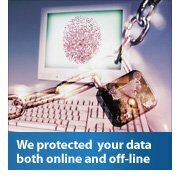 VeriPayment.com takes every precaution to protect our users' information. When users submit sensitive information via the website, your information is protected both online and off-line. When our registration/order form asks users to enter sensitive information (such as credit card number and/or social security number), that information is encrypted and is protected with the best encryption software in the industry - SSL. While on a secure page, such as our order form, the lock icon on the bottom of Web browsers such as Netscape Navigator and Microsoft Internet Explorer becomes locked, as opposed to un-locked, or open, when you are just 'surfing'. 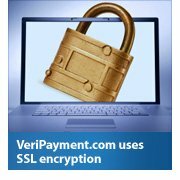 VeriPayment.com uses SSL encryption to protect sensitive information online, we also do everything in our power to protect user-information off-line. All of our users' information, not just the sensitive information mentioned above, is restricted in our offices. Only employees who need the information to perform a specific job (for example, our billing clerk or a customer service representative) are granted access to personally identifiable information. Furthermore, ALL employees are kept up-to-date on our security and privacy practices. This agreement govern in accordance with the provisions of the Act of the United Kingdom. You hereby irrevocably consent to the exclusive jurisdiction and venue of courts in the United Kingdom for all disputes arising out of or relating to the use of the VeriPayment.com Sites/Services. You agree that no joint venture, partnership, employment, or agency relationship exists between you and VeriPayment.com as a result of this agreement or use of the VeriPayment.com Sites/Services. You agree to indemnify and hold VeriPayment.com, its parents, subsidiaries, affiliates, officers and employees, harmless from any claim, demand, or damage, including reasonable attorneys' fees, asserted by any third party due to or arising out of your use of or conduct on the VeriPayment.com Site/Service/Software. VeriPayment.com reserves the right to disclose any personal information about you or your use of the VeriPayment.com Sites/Services, including its contents, without your prior permission if VeriPayment.com has a good faith belief that such action is necessary to: (1) conform to legal requirements or comply with legal process; (2) protect and defend the rights or property of Verified Payment Solutions or its affiliated companies; (3) enforce the terms or use; or (4) act to protect the interests of its members or others. VeriPayment.com performance of this agreement is subject to existing laws and legal process, and nothing contained in this agreement is in derogation of VeriPayment.com right to comply with governmental, court and law enforcement requests or requirements relating to your use of the VeriPayment.com Sites/Services or information provided to or gathered by VeriPayment.com with respect to such use. If any part of this agreement is determined to be invalid or unenforceable pursuant to applicable law of the United Kingdom, but not limited to, the warranty disclaimers and liability limitations set forth above, then the invalid or unenforceable provision will be deemed superseded by a valid, enforceable provision that most closely matches the intent of the original provision and the remainder of the agreement shall continue in effect. Unless otherwise specified herein, this agreement constitutes the entire agreement between the user and Verified Payment Solutions with respect to the VeriPayment.com Site/Service/Software and it supersedes all prior or contemporaneous communications and proposals, whether electronic, oral or written, between the user and Verified Payment Solutions with respect to the VeriPayment.com Site/Service/Software. A printed version of this agreement and of any notice given in electronic form shall be admissible in judicial or administrative proceedings based upon or relating to this agreement to the same extent and subject to the same conditions as other business documents and records originally generated and maintained in printed form.